The boat is at Filey Sailing Club, Yorks. It has new tubes 2016, bright blue, from Henshaws, in very good condition. Good condition trampoline, and trampoline cover. Stainless steel tow bar for tractor to move boat on beach. Anthea Firth: 07837771042, and anthea.firth@yahoo.co. 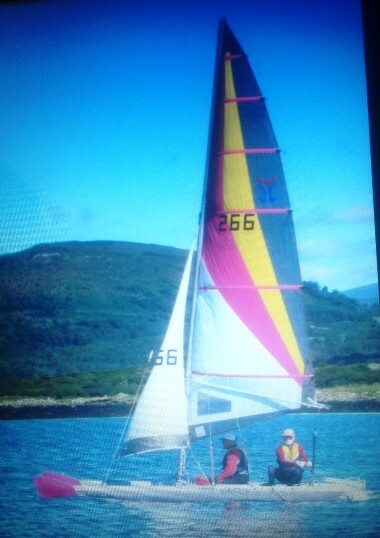 Bought 1992, and sailed mainly on Windermere and more recently on the sea. Little used in the last 10 years, and everything is in working order. Launching wheels,and jib fine, mainsail no patches. THE CATAPULT ASSOC. WANTS BOATS FOR SALE! WANTING TO BUY A CATAPULT? Yachts & Yachting and Dinghy Sailing mags are a good source.